Towers lift a camera package straight up and down for amazing linear moves. They save space by occupying a very small foot print. All of our towers are built with the highest level of precision by RTS (Rail & Tracking Systems, GmbH,), unlike any other tower on the market. This allows them to provide on air moves using the full range of the lens. Many of our towers can also be put on our Railcams for an incredibly dynamic move. Tower 12 has the lowest starting height and range of motion of any tower on the market. With a minimum lens height of 4'6" it allows the camera to start below shoulder height and lift to 12' giving an amazing perspective shift. This tower is perfect for on-stage reverse shots, or discretely seated right in the middle of an audience. It's small footprint allows for discrete placement on or off stage. 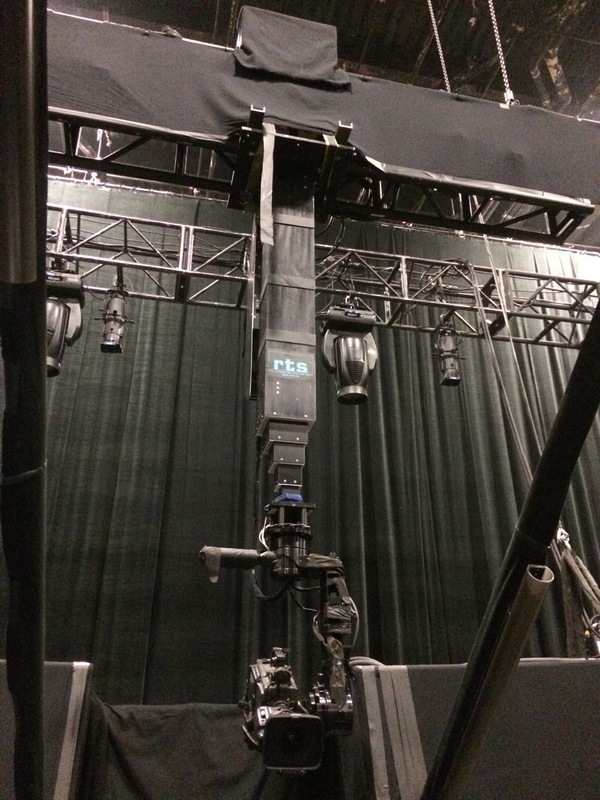 This tower can also ride on a Railcam™ for a 12' tracking tower we call RailTower™ which is fully capable of on-air moves using the full range of the lens. Tower21 has a starting lens height of 7' with a top height of 21'. This allows for a full 14' of movement while remaining in a very small footprint. The starting height makes this tower perfect for stages with a 6' deck height, putting the camera just at stage height with a 14' rise. This is optimized when a hole is cut in the stage allowing just the camera and columns to be seen. The small footprint also allows moving house shots in small venues or tighter spaces. This tower can also be placed on dolly track for left and right movement. Most of our towers also have the ability to work upside down. This allows for stable moving reverse shots, with the ability to quickly disappear. Hanging towers can also be added to track.